The pioneer settlement of Cummins developed at this site about 1890 around the saddle and harness shop of the earliest permanent settler, Mississippi native Robert Benjamin Cummins (b. 1848). A post office opened here in 1890 with J.H. Kellis as postmaster. The following year the nearby town of Sterling City (1.9 miles east) was founded. 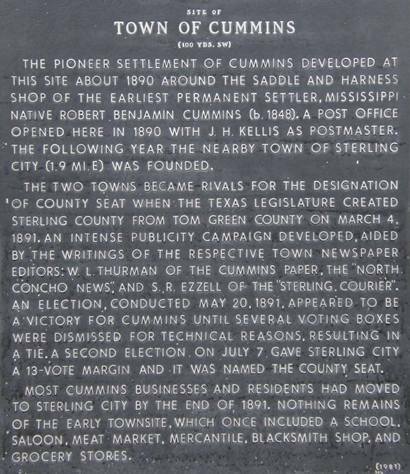 The two towns became rivals for the designation of county seat when the Texas Legislature created Sterling County from Tom Green County on March 4, 1891. An intense publicity campaign developed, aided by the writings of the respective town newspaper editors: W. L. Thurman of the Cummins paper, the "North Concho News", and S. R. Ezzell of the "Sterling Courier". An election, conducted May 20, 1891, appeared to be a victory for Cummins until several voting boxes were dismissed for technical reasons, resulting in a tie. A second election on July 7 gave Sterling City a 13-vote margin and it was named the county seat. Most Cummins businesses and residents had moved to Sterling City by the end of 1891. Nothing remains of the early townsite, which once included a school, saloon, meat market, mercantile, blacksmith shop, and grocery stores.